It was 1949, and the world was beginning to recover from World War II. New auto models finally were coming out of Detroit, television was starting to take hold, and the Cold War was gaining momentum. Walt Disney Productions saw that it was time to start returning to its pre-war mission of bringing fairytales to life, but it still had one more Package Era film to deliver. 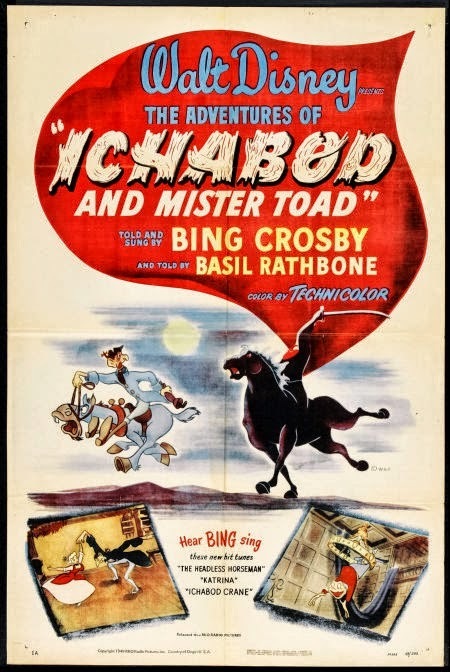 "The Adventures of Ichabod and Mr. Toad" (1949) was a good transition film, as it edged back towards telling classic tales in a longer format, but it still retained the unstructured format of the previous Package Era films such as "Saludos Amigos" and "Make Mine Music." It also features some top Hollywood names, a look past near-term plans and a foreshadowing of animation films in modern Hollywood. We are in a live-action library, and this leads to two animated shorts. The first is "The Wind in the Willows," narrated by British film star Basil Rathbone. Rathbone was famous for roles in horror films and swashbuckling film duels with the likes of Errol Flynn. He was an outstanding fencer and well known to audiences of the day. He tells the tale of J. Thaddeus Toad, Esq., the wealthy owner in 1906 of Toad Hall. Toad is carefree, which has caused him to become greatly indebted. He follows the fads of the day to his detriment, and wants one of the new motorcars that he sees being driven about. He trades the deed for Toad Hall for such a car, but the deal turns sour and he is sentenced to twenty years in the Tower of London for supposed car theft due to false testimony by Mr. Winkle, a tavernkeeper. Toad's loyal horse, Cyril Proudbottom, visits him on Christmas Eve and helps him to escape. They elude the police and meet Toad's friends, Ratty (a water rat) and Mole (a mole). Toad learns that Winkle and his gang of tough badgers have taken over Toad Hall and vows to get revenge. Toad and his friends fight the fraudsters, and Toad manages to recover his deed to the Hall. He promises to become more responsible, but the segment ends with his friends seeing Toad captivated by a new-fangled airplane and flying off in it with Cyril. The second segment, "The Legend of Sleepy Hollow," is narrated by an even bigger star, Bing Crosby. You didn't get any more famous than Crosby in 1949, and it's amazing that Walt Disney was able to corral him for this film. 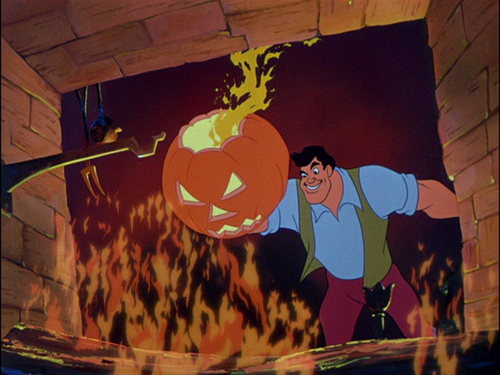 Crosby narrates the tale of Sleepy Hollow, in which Ichabod Crane moves to Sleepy Hollow in order to become the new schoolmaster. 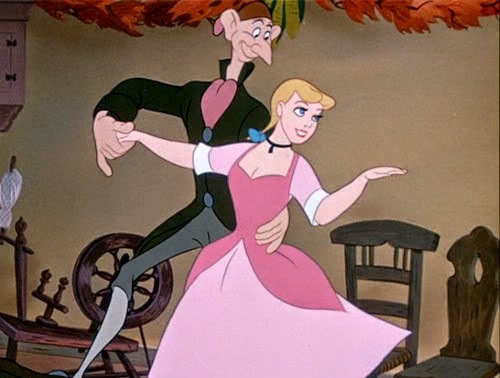 Crane is tall, lanky, gluttonous and extremely superstitious, but women are attracted to the eligible new schoolmaster. 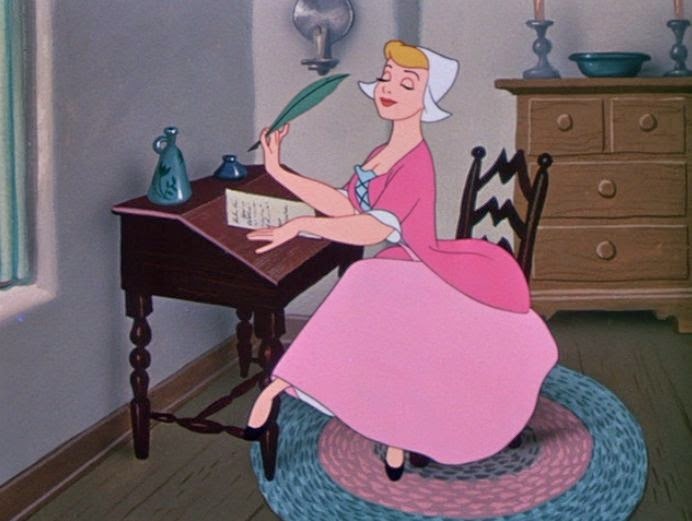 Brom Bones, a town low-life, doesn't like the competition and causes as much trouble for Ichabod as he can, but the schoolmaster soon falls in love with the lovely Katrina van Tassel. She is the beautiful daughter of Baltus van Tassel, the richest man in town, and Ichabod has designs on the family fortune. Brom, meanwhile, also desires Katrina and the two have had a thing going. Katrina enjoys Ichabod's attentions, but secretly still prefers the company of Brom and only uses Ichabod to make Brom jealous. 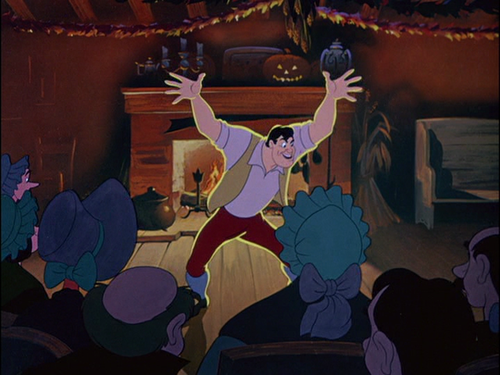 The van Tassels have a grand Halloween party, and Brom shows up with an overweight lady while Ichabod is with Katrina. He makes a move on Katrina, but he is humiliated. Brom figures out that Ichabod is superstitious and plans to use this against his rival. He tells via a song the tale of a legendary Headless Horseman, the ghost of a Revolutionary War soldier. The Headless Horseman supposedly lost his head during the war and returns from the grave every Halloween seeking it. Brom claims to have seen the Headless Horseman the previous year, but eluded him by crossing a nearby bridge. Katrina thinks that the whole thing is a joke, but superstitious Ichabod takes it seriously. Ichabod is quite polite - is that a good thing? Returning home from the party, Ichabod is terrified. He has to cross a cemetery, and convinces himself that he can hear the horse of the Headless Horseman. It turns out to be a false alarm, but then he sees the Headless Horseman himself approaching. Ichabod flees and, remembering what Brom had told him, crosses the bridge. 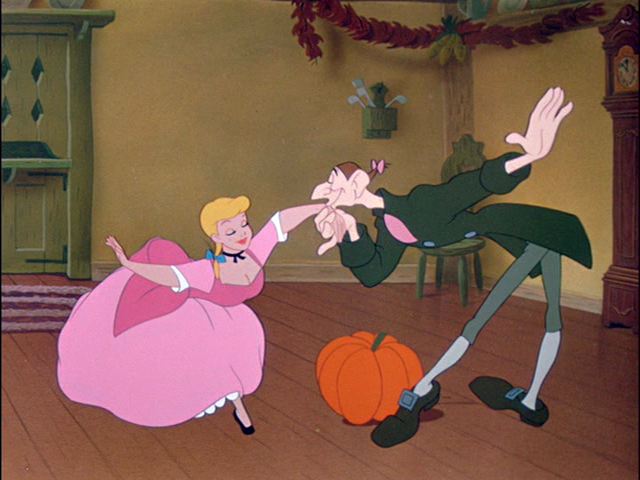 The Headless Horseman stops, but takes off his head (a jack-'o-lantern) and throws it at Ichabod. 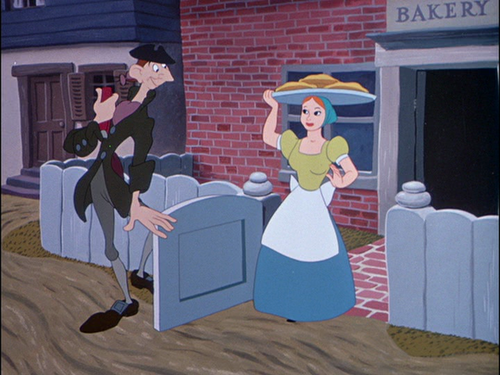 Ichabod is never seen again, Brom marries Katrina, and rumors fly that Ichabod either married the overweight lady who had been Brom's date and had many children, or was taken to parts unknown by the Headless Horseman. Crosby not only narrates, but he voices all the parts of the second segment. Eric Blore plays Toad, and Pat O'Malley voices Cyril and several other characters in the first segment. The concept for the first segment pre-dated the war, but it had been shelved due to all the related problems and wartime propaganda projects that had taken top priority. Rather than completely forget about it, Walt Disney brought the project back to life once things had settled down, although greatly whittling it down to make it part of a larger package rather than the feature-length film originally envisioned. After a lot of deliberation and revisions, it finally was paired with the "Sleepy Hollow" segment, which also originally had been intended as a feature film but simply didn't have the heft (though that didn't stop a much later live-action production directed by Tim Burton and starring Johnny Depp). 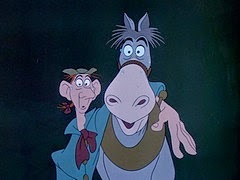 You can tell that the Disney studio was getting back into gear with "The Adventures of Ichabod and Mr. Toad." 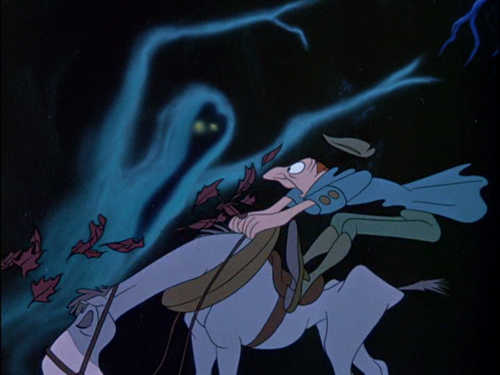 The animation, of course, was crisp and fun, particularly the midnight ride of Ichabod facing the Headless Horseman. As you would expect, the quality of the production was top-notch. It was the return to epic story-telling, though, that was the real key. Rather than just assemble a bunch of unrelated music videos such as "Make Mine Music," this film portrays a tale straight out of Americana along with another which evokes our collective history. While the use of Crosby was probably overkill for such a simple film, he does a terrific job in his usual amiable way and was the first of the celebrity voice actors, a development which did not truly take hold until the 1980s and 1990s. The production also shows how versatile Disney had become. "Mr. Toad" is a quintessentially British production, from the narrator down to characters who are full of stereotypical British mannerisms. 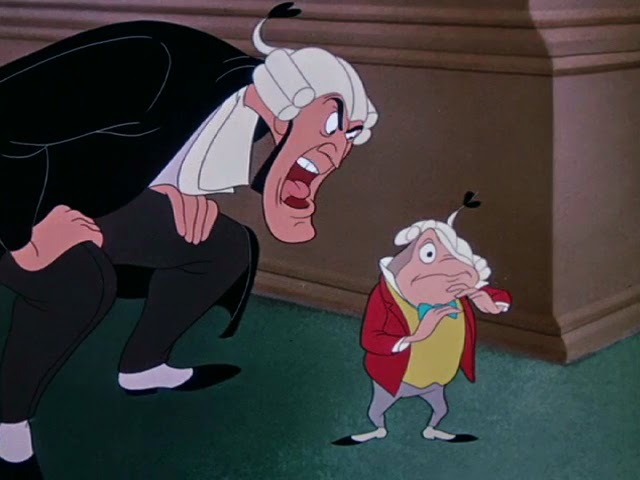 The courtroom machinations are shown in detail, which is quite unusual for an animated film and deepens the sense of British society. 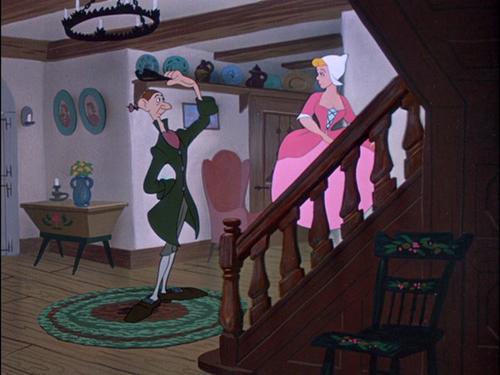 It is all a bit high-brow, perhaps the most literary production in the Disney canon. Fortunately, the "Mr. Toad" manages to serve up a wild action finale which prevents anyone from getting bored. 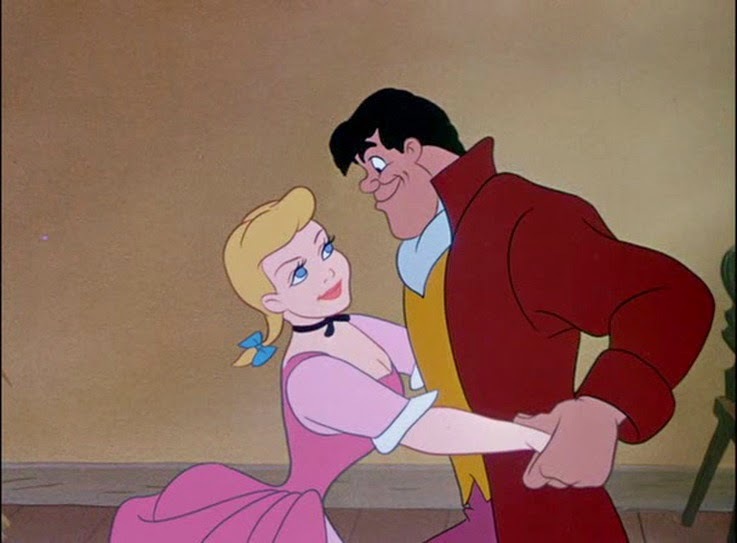 Truth be told, this is the weaker of the two segments because the animation is good but not stellar as in the second segment, and we never develop as much of an emotional attachment to the rather staid and proper British characters as we do the earthy Americans in "Sleepy Hollow." Sorry if that offends, but that is how it comes across to this viewer. Meanwhile, the "Sleepy Hollow" segment aims in a completely different direction, zeroing in on the lowest common denominator of the audience. Ichabod is not so much a hero as an anti-hero, with a foppish demeanor and impure motives that usually signal a Disney villain. In short, he is not very manly, while Brom is too manly, and you can tell who is going to tell by knowing this was made in the 1940s. That Ichabod gets his ultimate come-uppance is a complete turn-around from what anyone unfamiliar with the Washington Irving tale would suspect, and the fact that Brom triumphs is almost a Cinderella story of redemption and triumph. Brom, while a classic Disney villain, a vain jerk who bullies others and wins only through devious trickery, remains more in keeping with what men were "supposed" to be like. Katrina, meanwhile, is the ultimate Disney siren, with big blue eyes, blond hair and a coquettish manner. Despite the fact that it is a well-worn tale, the production still packs a punch. All in all, it is a surprising segment that manages to turn the tables on all concerned and gives the production some depth that you don't really expect. "The Adventures of Ichabod and Mr. Toad" is by no means a classic, but it is a quality production that deserves more attention than it has received as an almost throwaway project before the true heavy hitters of the 1950s. 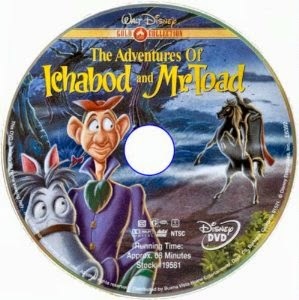 Below is the home video trailer for "The Adventures of Ichabod and Mr. Toad."